Visit www.otisreddingfoundation.org for more information and tickets! 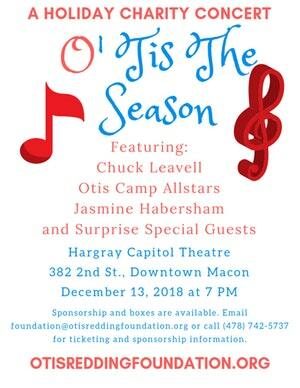 “O’tis the Season is our first ever Christmas fundraiser that we’re gonna do here benefitting the Otis Redding foundation and the Otis Redding center for creative arts,” said Justin Andrews, the director of Special Projects & Outreach for the Otis Redding Foundation. Programs like music education camps, that have been giving central Georgia kids a creative outlet for over a decade. “We’re big on of course music and education, that’s our number one component. But we also take that and turn it into being positive role models for the kids and of course giving them the confidence to do whatever it is they want in life and not have anyone tell them no or that’s something that they can’t do,” says Andrews. Instilling in the next generation, the creativity of a man who helped put Macon on the map. “You’ve got to keep Otis Redding relevant because without Otis, some of these new musicians that you hear now they either wouldn’t exist or wouldn’t have the sound that everyone loves coming from these new artists”, says Andrews. “O’tis the Season” is on Thursday, December 13th. You’ll hear from some of the kids involved in the music camp and also some more well-known artists like Chuck Leavell. Tickets range from $25 to $50. You can buy them and find out more information at otisreddingfoundation.org.